MONTREAL and TORONTO, March 11, 2019 /CNW Telbec/ - SEMAFO Inc. (TSX: SMF) (OMX: SMF) ("SEMAFO") and Savary Gold Corp. (TSX-V: SCA) ("Savary") are pleased to announce that they have entered into a definitive combination agreement (the "Combination Agreement") pursuant to which SEMAFO will acquire all of the issued and outstanding common shares of Savary (the "Savary Shares") not already owned by it. The transaction is being carried out by way of a three-cornered amalgamation (the "Amalgamation"). Savary shareholders will vote on the Amalgamation at a special meeting of Savary shareholders (the "Savary Meeting") with closing expected to take place by the end of April 2019. Under the terms of the Combination Agreement, Savary shareholders will receive 0.0336 of a SEMAFO common share (the "SEMAFO Shares") for each Savary Share (the "Exchange Ratio"). The Exchange Ratio is the same as was announced on February 11, 2019. 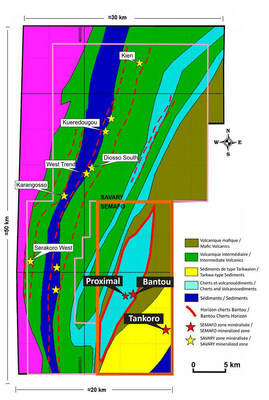 All of Savary management and board and significant shareholders, together representing 29.3% of the Savary Shares, are supportive of the combination and have entered into support agreements (collectively, the "Support Agreements") with SEMAFO to vote their Savary Shares in favour of the Amalgamation. Accelerated Resource Growth – The 2019 consolidated exploration program will focus on accelerated resource growth on a consolidated basis and will be announced post-closing. Benoit Desormeaux, President and CEO of SEMAFO, stated "Our acquisition of the Karankasso property reflects our core strategy of creating long-term value through developing and operating high quality assets. The acquisition provides a consolidated district-scale land package in a country we know well and on the prolific Houndé Greenstone Belt, which we also know very well. We see excellent potential for resource growth on the combined 1,250 km², and when this transaction is consummated we anticipate the combined property will head up our development pipeline." Don Dudek, President and CEO of Savary, said, "Over the past few years, Savary has delivered on its commitment to create value for its shareholders through its disciplined approach to exploration and resource development. The transaction with SEMAFO is consistent with that commitment as our shareholders will benefit from having ownership in an intermediate, multi-mine producer with a portfolio of high-quality assets and a proven and experienced management team that shares our commitment to creating long-term sustainable value. On closing, our shareholders can maintain exposure to the district-scale land package as it becomes one of SEMAFO's top development pipeline projects." The Combination Agreement follows the announcement by way of a joint press release dated February 11, 2019 that SEMAFO and Savary had entered into a non-binding letter of intent in respect of a proposed acquisition of Savary by SEMAFO. Subject to TSX Venture Exchange, Toronto Stock Exchange (the "TSX") and any other required regulatory authority approval, outstanding Savary options and warrants will be exercisable in accordance with their terms into SEMAFO Shares at the Exchange Ratio until their expiry date. Pursuant to the Amalgamation, SEMAFO will issue approximately 7.26 million SEMAFO Shares to Savary shareholders (other than itself) and Savary will amalgamate with a newly-incorporated wholly-owned subsidiary of SEMAFO to become a wholly-owned subsidiary of SEMAFO. The Amalgamation represents approximately 2.2% dilution to SEMAFO shareholders. Implementation of the Amalgamation is subject to approval by (i) at least two-thirds of the votes cast by all Savary shareholders and (ii) a simple majority of the votes cast by Savary shareholders other than SEMAFO, all at the Savary Meeting. In addition to shareholder approval, completion of the Amalgamation is subject to the receipt of regulatory approvals, including stock exchange approvals, as well as certain other closing conditions customary in transactions of this nature. The Combination Agreement contains customary non-solicitation provisions which are subject to Savary's right to consider and accept a superior proposal subject to a matching right in favour of SEMAFO. In the event that the Amalgamation is not completed as a result of a superior proposal or in certain specified circumstances, Savary will pay SEMAFO a termination fee in the amount of $750,000. SEMAFO currently owns approximately 15.5% of the issued and outstanding Savary Shares. As such, SEMAFO is considered a "related party" of Savary in respect of the Amalgamation and the Amalgamation is considered to be a "business combination" for Savary pursuant to Multilateral Instrument 61-101 – Protection of Minority Security Holders in Special Transactions ("MI 61-101"). Savary will therefore seek approval of the Amalgamation from disinterested Savary shareholders at the Savary Meeting, as required by section 5.6 of MI 61-101. Savary is relying on the formal valuation exemption in section 5.5(b) of MI 61-101, on the basis that no securities of Savary are listed on the TSX or other specified markets. Full details of the Amalgamation will be included in the management information circular to be filed with regulatory authorities and mailed to the Savary shareholders in accordance with applicable securities laws. The record date for the Savary Meeting will be announced in the near future. The board of directors of Savary (the "Savary Board") has formed a special committee (the "Special Committee") to consider and evaluate the Amalgamation. The Special Committee, following a review of the terms and conditions of the Combination Agreement and consideration of a number of factors, unanimously recommended that the Savary Board approve the Amalgamation. After receiving the recommendation of the Special Committee and advice, including a fairness opinion, from its advisors, the Savary Board has unanimously determined that the Amalgamation is in the best interests of Savary and is fair, from a financial point of view, to Savary shareholders (other than SEMAFO and its affiliates) and will recommend that Savary shareholders vote in favour of the Amalgamation. Prior to the execution of the Combination Agreement, Red Cloud Klondike Strike Inc. provided an opinion that, based upon and subject to the assumptions, limitations and qualifications in such opinion, the consideration to be received by Savary shareholders is fair, from a financial point of view, to Savary shareholders (other than SEMAFO and its affiliates). A copy of the fairness opinion will also be included in the Savary management information circular. If the Amalgamation is completed, the Savary Shares will be delisted from the TSX Venture Exchange. A copy of the Combination Agreement will be available through Savary's and SEMAFO's filings with the applicable securities regulatory authorities in Canada on SEDAR at www.sedar.com. Norton Rose Fulbright Canada LLP is acting as SEMAFO's legal advisor. Red Cloud Klondike Strike Inc. is acting as financial advisor to the Board of Directors of Savary. Dentons Canada LLP is acting as Savary's legal advisor. This business combination is made for the securities of a foreign company. The offer is subject to disclosure requirements of a foreign country that are different from those of the United States. Financial statements to be included in the Savary management information circular, if any, have been prepared in accordance with International Financial Reporting Standards as issued by the International Accounting Standards Board, that may not be comparable to the financial statements of United States companies. It may be difficult for you to enforce your rights and any claim you may have arising under the federal securities laws, since each of SEMAFO and Savary is incorporated in a province of Canada, and some or all of their respective officers and directors are residents of Canada. You may not be able to sue either SEMAFO or Savary or their officers or directors in a foreign court for violations of the U.S. securities laws. It may be difficult to compel SEMAFO or Savary or their respective affiliates to subject themselves to a U.S. court's judgment. This press release is not an offer of securities for sale in the United States. Securities may not be offered or sold in the United States absent registration or an exemption from the registration requirements. The SEMAFO Shares that will be issued to Savary shareholders will not be registered under the United States Securities Act of 1933, as amended (the "U.S. Securities Act"), or the securities laws of any state of the United States and will be issued in the United States in reliance on the exemption from the registration requirements of the U.S. Securities Act set out in Rule 802 thereunder and exemptions provided under the securities laws of each applicable state of the United States. Copies of the Savary management information circular (including any documents to be incorporated therein), Combination Agreement and certain other reports or information related to the Amalgamation will be made available through SEMAFO's filings with the United States Securities and Exchange Commission at www.sec.gov. This press release contains forward-looking statements. Forward-looking statements involve known and unknown risks, uncertainties and assumptions and accordingly, actual results and future events could differ materially from those expressed or implied in such statements. You are hence cautioned not to place undue reliance on forward-looking statements. All statements other than statements of present or historical fact are forward-looking statements, including statements with respect to the Amalgamation and the likelihood that the Amalgamation will be consummated on the terms and timeline provided herein or at all, SEMAFO's business and growth strategies, prospects, operations, projects, development and exploration plans following the Amalgamation, the anticipated timing of the special meeting of shareholders of Savary and of the completion of the Amalgamation, the benefits of the Amalgamation to SEMAFO and Savary and the receipt of all required approvals, including without limitation the shareholders of Savary, and applicable regulatory authorities and applicable stock exchanges. Forward-looking statements include words or expressions such as "will", "may", "shall", "if", "subject to", "in the event", "expected", and other similar words or expressions. In respect of the forward-looking statements and information concerning the likelihood that the Amalgamation will be consummated and the anticipated benefits of the completion of the Amalgamation, SEMAFO and Savary have provided such statements and information in reliance on certain assumptions that they each believe are reasonable at this time, including assumptions as to the ability of the parties to receive, in a timely manner and on satisfactory terms, the necessary regulatory, stock exchange and shareholder approvals where applicable; the ability of the parties to satisfy, in a timely manner, the other conditions to the completion of the Amalgamation; general assumptions respecting the business and operations of both SEMAFO and Savary, including that each business will continue to operate in a manner consistent with past practice and pursuant to certain industry and market conditions; and other expectations and assumptions concerning the Amalgamation. Although SEMAFO and Savary believe that the expectations reflected in these forward-looking statements are reasonable, neither SEMAFO nor Savary can give assurance that these expectations will prove to have been correct, that the Amalgamation will be completed or that it will be completed on the terms and conditions contemplated in this press release. Accordingly, investors and others are cautioned that undue reliance should not be placed on any forward-looking statements. For additional information with respect to other assumptions underlying the forward-looking statements made in this press release, refer to the Outlook and Strategy and forward-looking statements sections in SEMAFO's management's discussion and analysis for the financial year ended December 31, 2018 and for the most recently completed interim period, which are available at www.sedar.com. Factors that could cause future results or events to differ materially from current expectations expressed or implied by the forward-looking statements include, without limitation, significant transaction costs or unknown liabilities; economic, competitive, political and social uncertainties; the state of capital markets; risks relating to (i) the ability of the parties to satisfy the closing conditions of the Combination Agreement, (ii) the ability of the Savary Board to consider and approve a superior proposal for Savary prior to the completion of the Amalgamation, (iii) failure to receive the necessary shareholder or regulatory approvals where applicable, or failure of the parties to obtain such approvals or satisfy such conditions in a timely manner, (iv) unforeseen challenges in integrating the businesses of Savary and SEMAFO, (v) failure to realize the anticipated benefits of the Amalgamation, (vi) the business, operational and/or financial performance or achievements of Savary or SEMAFO may be materially different from that currently anticipated, (v) other unforeseen events, developments, or factors causing any of the aforesaid expectations, assumptions, and other factors ultimately being inaccurate or irrelevant. In particular, the benefits anticipated in respect of the Amalgamation are based on the current business, operational and financial position of each of SEMAFO and Savary, which are subject to a number of risks and uncertainties. Readers are cautioned that the foregoing list of risks, uncertainties and assumptions are not exhaustive. In addition, if the Amalgamation is not completed, and Savary continues as an independent entity, there are risks that the announcement of the Combination Agreement and the dedication of substantial resources of SEMAFO and Savary to the completion of the Amalgamation could have an impact on each of their respective businesses and strategic relationships (including with regulatory bodies, future and prospective employees, customers, suppliers and partners), operating results and activities in general, and could have a material adverse effect on each of their current and future operations, financial condition and prospects. Consequently, the reader is cautioned not to place undue reliance on the forward-looking statements and information contained in this press release. The forward-looking statements in this press release reflect SEMAFO and Savary's expectations on the date hereof and are subject to change thereafter. You can find further information with respect to these and other risks in filings made with the Canadian securities regulatory authorities and available at www.sedar.com. SEMAFO's and Savary's documents are also available on their respective websites at www.semafo.com and www.savarygold.com. We disclaim any obligation to update or revise these forward-looking statements, except as required by applicable law.